(Not) Just Another Mom of Twins: What I Like About ME Mondays-Pay It Forward! "The wise know the value of friendship, and that it is wisdom to be a friend to oneself too." -A.C. Grayling Welcome to Week 7 of "What I Love About Me!" hosted by Twins Plus One, Three Times the Fun and Twingle Mommy! I LOVE...LOVE...LOVE Tim Hortons Coffee! (For my fellow Canadians, no explanation needed!) For my "International Blogger Buds" Tim Hortons coffee could best be compared to "heroin", only for your suburban-type-folks! I am NOT exaggerating, am I fellow Canucks...eh?!?! LOL! Seriously though, there have been rumors circulating our country for years regarding the "secret" added ingredient that makes so many people NEED their "Timmies" (nickname for their coffee). You can read more about that HERE if you are really that interested. I LOVE...LOVE...LOVE to "Pay It Forward" or I guess you would call it "Pay It Backwards" when I am in the drive-thru of a Tim Hortons. A few month's back, I pulled up to the drive-thru line of a Tim Hortons (which is ALWAYS backed up, sometimes on the street...no lie!) Anywho, me and another "swagger wagon" driver (a.k.a. stylin' momma in a mini van) pulled up almost at the same time, I was ahead of her by 1/2 a hair. I could see she had two young children with her and the desperation on her face was evident...she NEEDED her Timmies NOW!! My kids were having the time of their lives in the back seat and because I am a considerate & nice person (mostly) I waved her to go ahead of me. When I pulled up to the window to pay for my coffee, the lady said, "It's free of charge today. The woman ahead of you said to enjoy and thank you!" I swear you'd think I won the lottery!! I was tickled PINK. 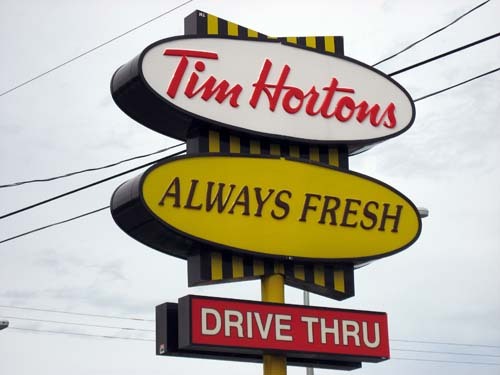 I had heard of the Tim Hortons "phenomena" where the person ahead pays for the person behinds coffee BUT in all my years, I had never experienced the "Pay It Backwards". Well my friends, I am proud to tell that I am now the QUEEN of "Pay It Backwards"! EVERY TIME (Well, almost every time...I've been short on cash a couple times.) there is a mom behind me with kids OR if someone is kind enough to "wave" me ahead of them....I BUY their coffee. The feeling I get from knowing that I might have made a total stranger smile and feel like they just won the lottery is WAY more addictive than any beverage, including Tim Hortons coffee! I am LOVIN' that I LOVE to "Pay It Backwards"!! Tell US what you Love about yourself this week! This is so nice and a great idea! I often let people with fewer groceries than me (usually every time I go to the store because I have 4 kiddos) go ahead of me, but getting a free coffee once in awhile would be awesome! that is really, REALLY nice of you, Ginger. Which reminds me I have something like that on my 36 things list.... and my bday is in less than 3 weeks :) so time to cross off the little ones. Thanks ladies...hope you all have a GREAT week!! P.S. Be sure to let me know if you "Pay It Backwards" and all about the experience...I just LOVE it! That is great. I know you're making someone's day since it happened to me at Starbucks. It was the morning of my transfer and the last day of school before summer break. I couldn't really afford to buy coffee, but I knew if I got pregnant that afternoon, it would be my last coffee for 9 months. When I pulled up to the window I felt so blessed by the person in front of me. As luck would have it, there was no one in line behind me so I didn't have the chance to pay it backward. Such a great thing to love! I remember how I felt when someone paid for my food at Taco Bell. I smiled for days. Paying it backwards is actually on my birthday list for this year. I better hurry up--I only have 5 months to go! That's so cool. I remember when I was in Calgary 3 years ago,I spent hours looking for a McDonalds and didn't understand why there were so many Tim Hortons and no Mickey Ds. Now I know.